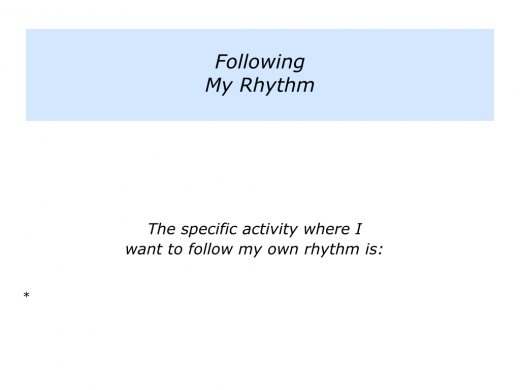 Every person has their own rhythm for living, working, resting and other activities. Some people learn to find and follow their chosen pattern. They are then able to channel their energy in a positive way. This is fine if they are working alone. 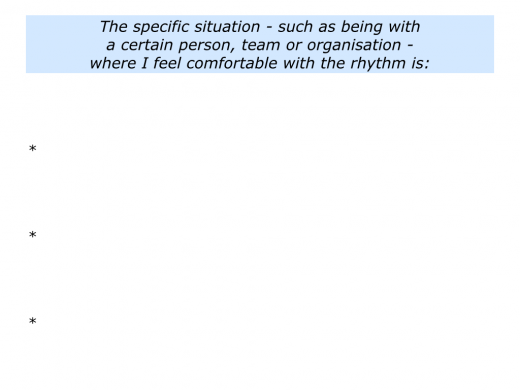 If they are working with others – such as individuals, teams and organisations – they may need to recognise and work with other people’s styles. Some people manage to do this successfully. But others can find that, after a while, they may have forgotten their own rhythm. This can create difficulties. Sometimes it can lead to people feeling strangers to themselves. 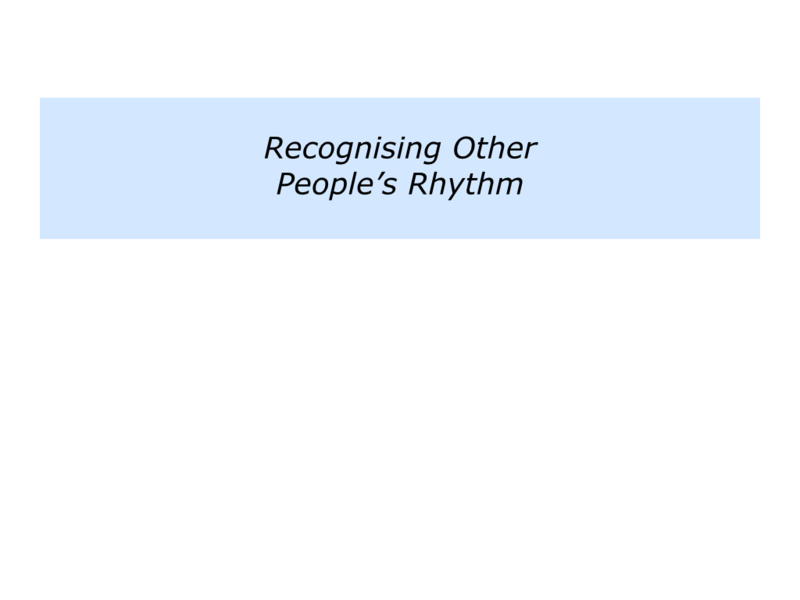 Imagine that you want to find your own rhythm whilst recognising and, when appropriate, managing other people’s styles. Here are some steps to consider. You will have different rhythms for different activities. 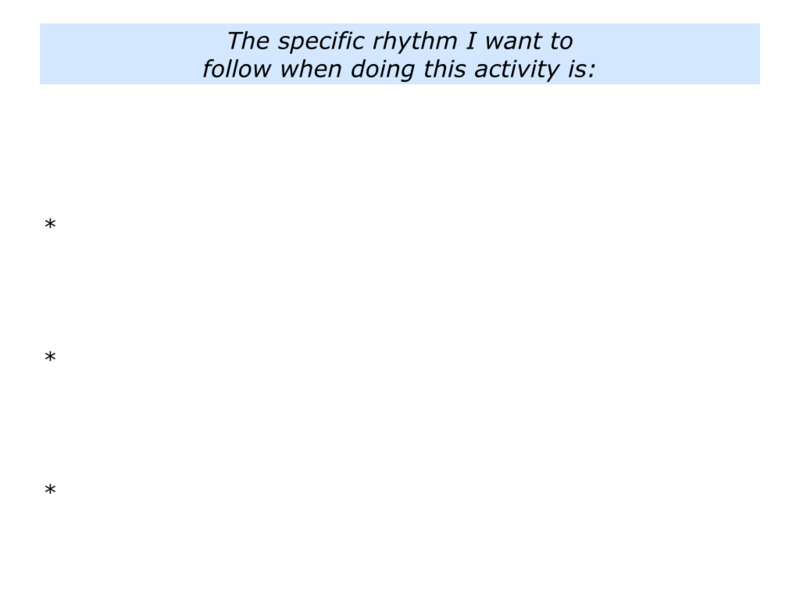 So start by selecting a specific activity where you want to find and follow your preferred style. “I chose to focus on my working week. Some of my work was satisfying, but sometimes I felt disjointed. It seemed like I was fitting into other people’s patterns, rather than my own. “I felt quite energetic working in the office on Monday and Tuesday, but then wanted to be on the road, visiting clients. So that is how I arranged my diary. Meeting customers on Wednesday and Thursday, with Friday spent working from home. Let’s return to your rhythm. Try tackling the exercise on this theme. This invites you to do the following things. 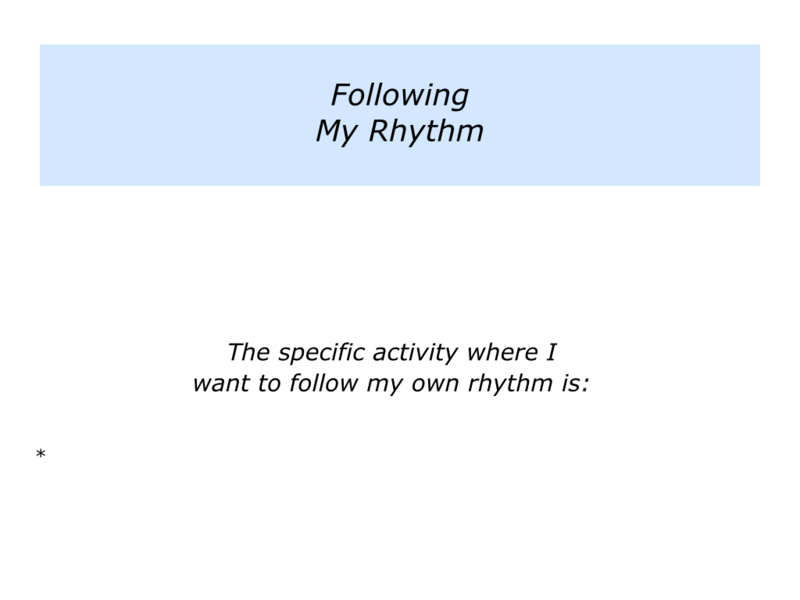 Describe a specific activity where you want to follow your own rhythm. 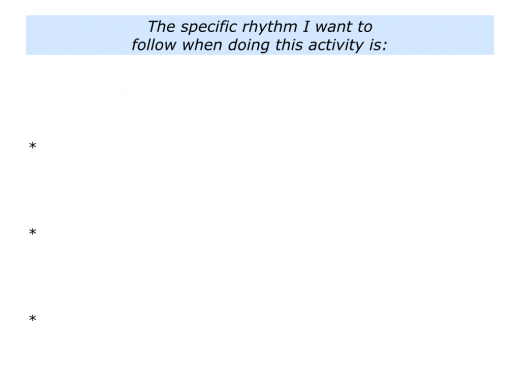 Describe the specific rhythm you want to follow when doing this activity. 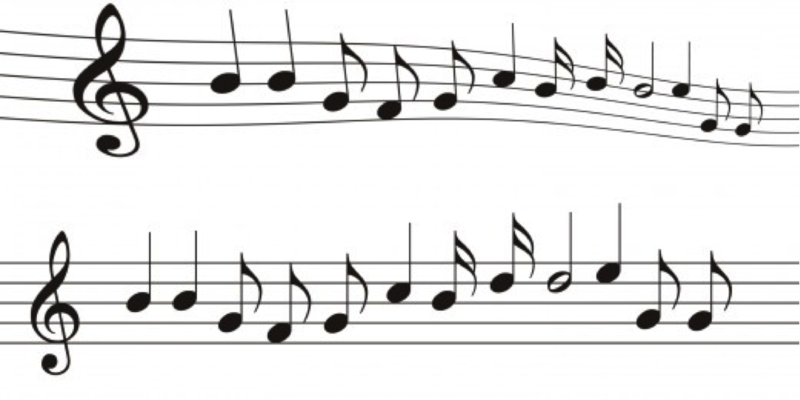 Describe the specific things you can do to follow this rhythm. You will feel comfortable with kindred spirits, people with whom you share similar values. 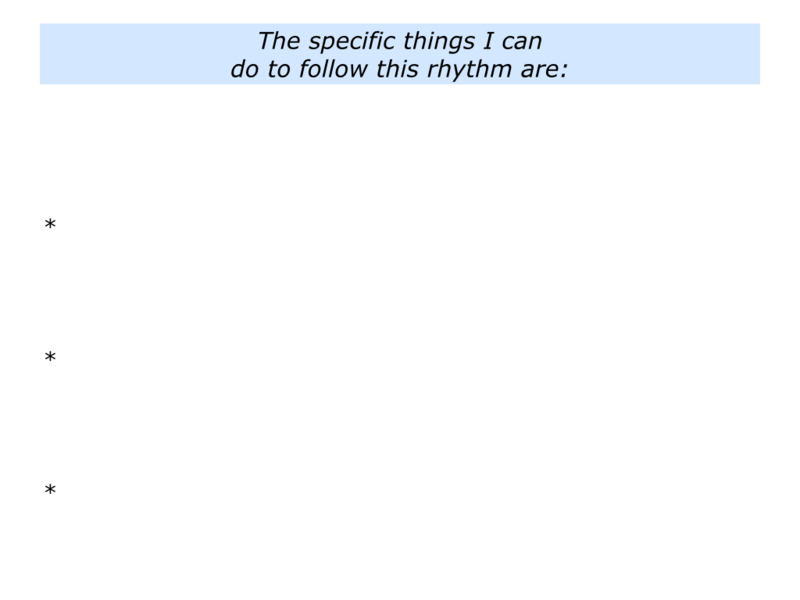 Such people may have a similar rhythm to yourself or, just as importantly, they have respect for your rhythm. 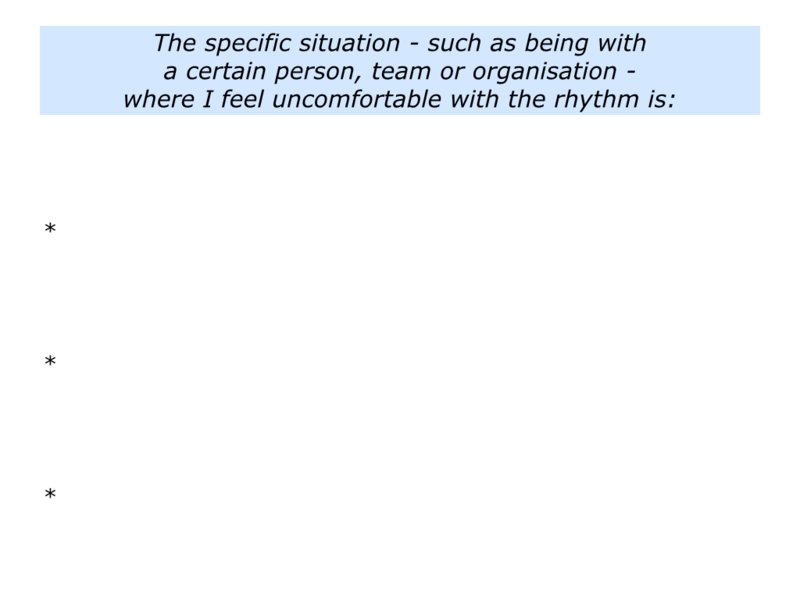 The difficulty comes with people who have a rhythm that is alien to yours or try to impose their rhythm on other people. 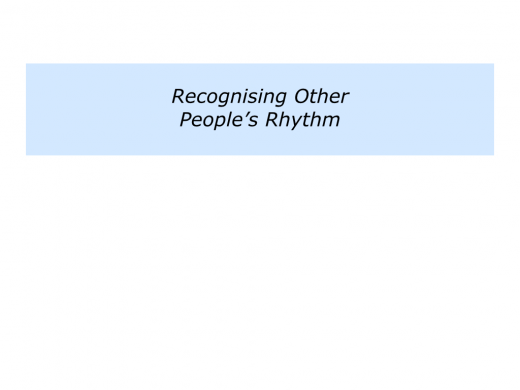 If you work with other people in a team or organisation, it is likely that they have their own rhythm. You will quickly get a feeling about whether or not you feel comfortable with this pattern. Organisations have the right to set their own working style, so it is important to recognise this rhythm. 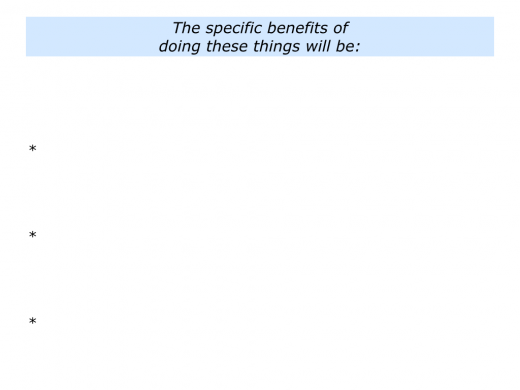 This does not necessarily mean, of course, that the approach they choose is effective. Bearing this in mind, try tackling the following exercise. This invites you to do the following things. 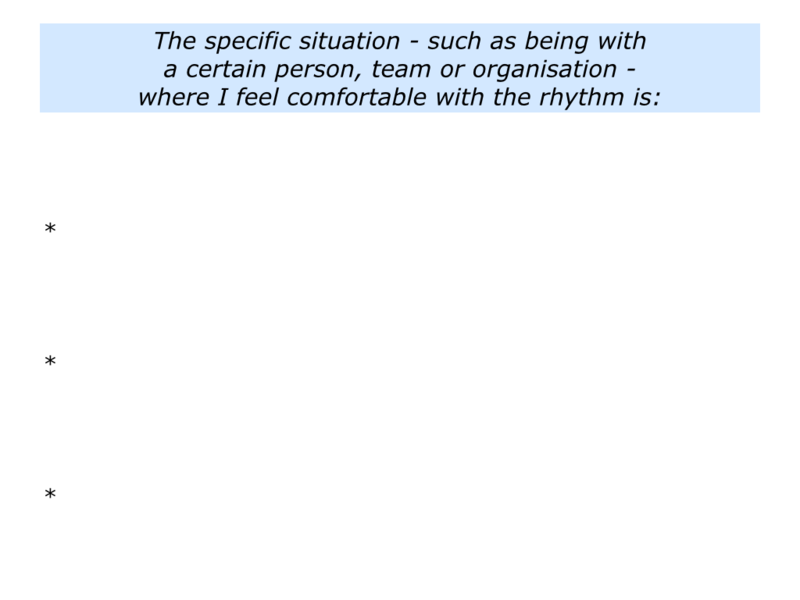 Describe a specific situation – such as being with a particular person, team or organisation – where you feel comfortable with the rhythm. 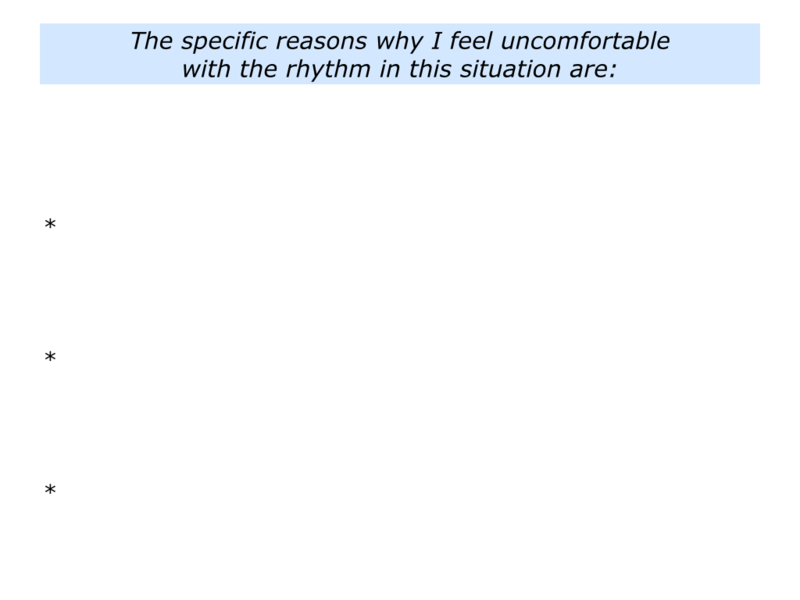 Describe the reasons why you feel comfortable with this rhythm. 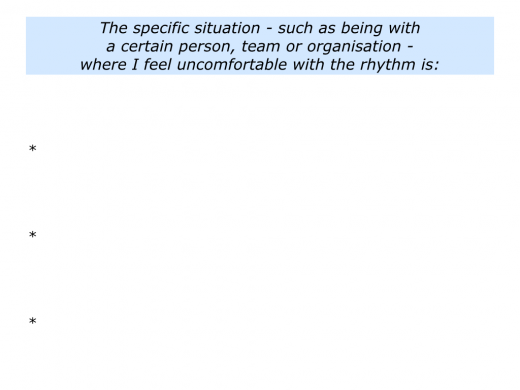 Describe a specific situation – such as being with a particular person, team or organisation – where you feel uncomfortable with the rhythm. 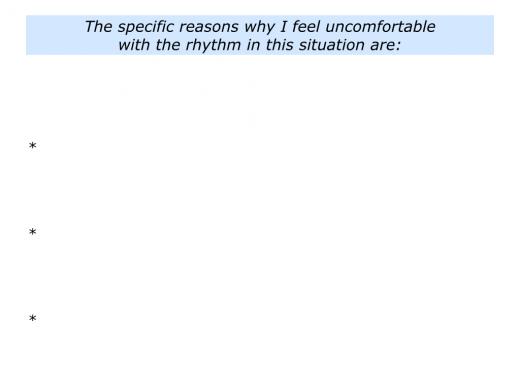 Describe the reasons why you feel uncomfortable with this rhythm. 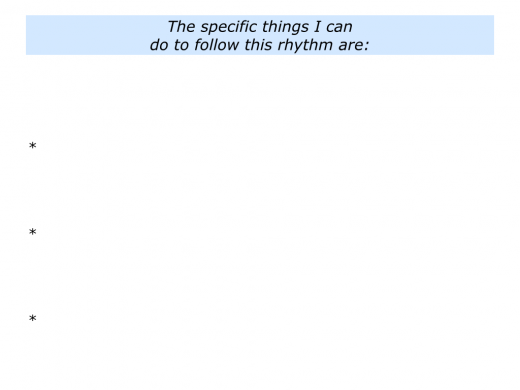 As mentioned earlier, it can be important to keep following your rhythm. You may also wish to find ways to deal with situations where the people, team or organisation has a different working pattern. 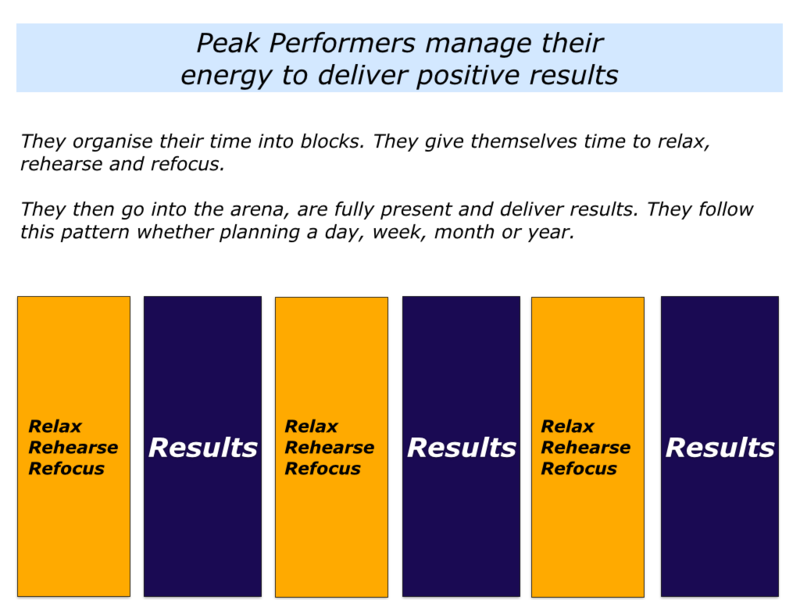 Peak performers, for example, often divide their time into blocks. This enables them to build in time to relax, rehearse and rise to the occasion when it matters. 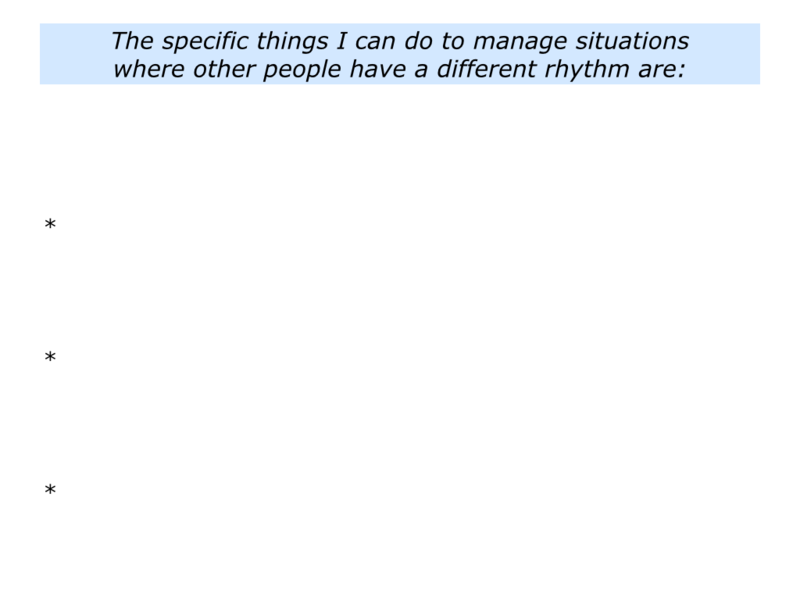 Different people have different rhythms in different aspects of their lives. “I used to have difficulty with managers who spoke quickly and aimed to spur others into action. “My own style is more reflective. But, for a while, I tried to match the quick talkers and respond. Unfortunately this did not help to get the work done properly. “Later on I learned to be calm. I did this by learning to breathe properly, listen fully and try to summarise what a manager had said. “Then I spoke in my own speed, reassuring them that I would fix things. 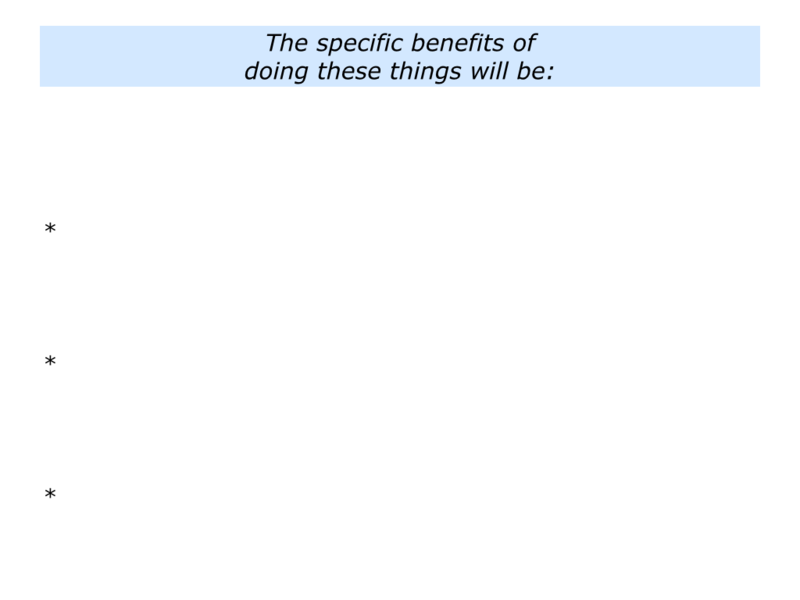 If necessary, I checked information to make sure I was clear on what they wanted and by when. 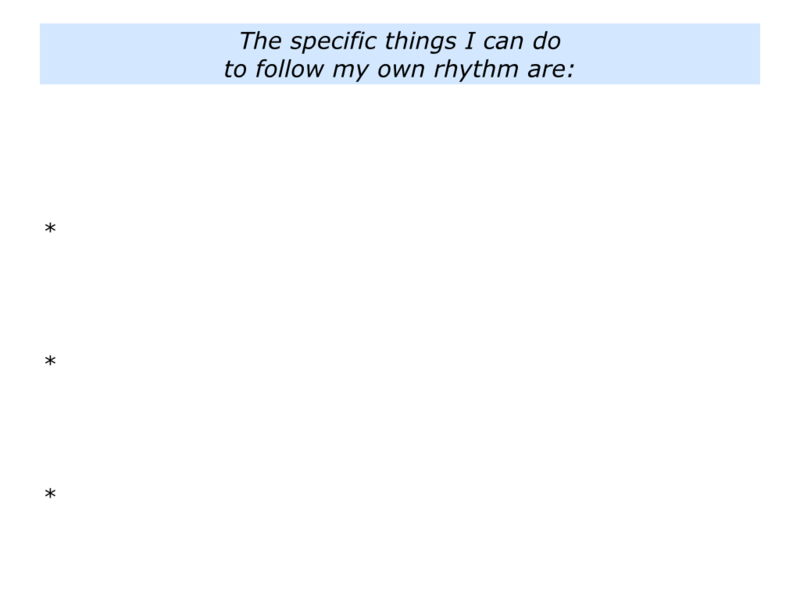 It is vital to find and follow your own rhythm. 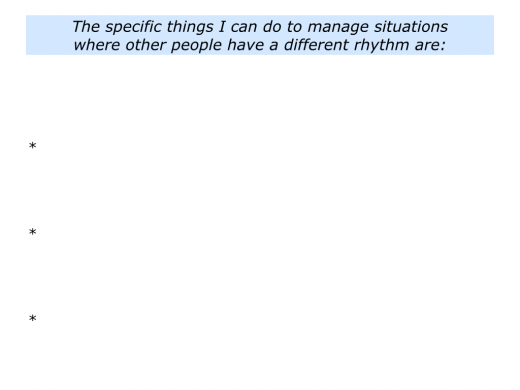 At the same time, it can be useful to find ways of managing situations in which people have other approaches. 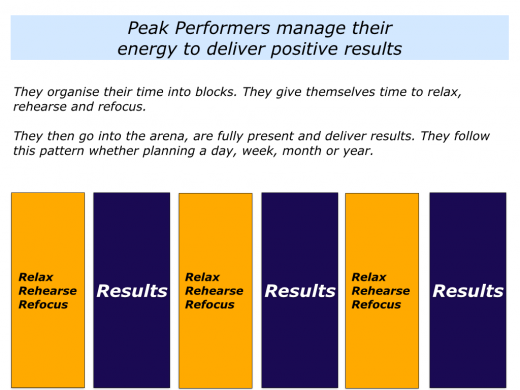 You can then work with them to achieve peak performance. 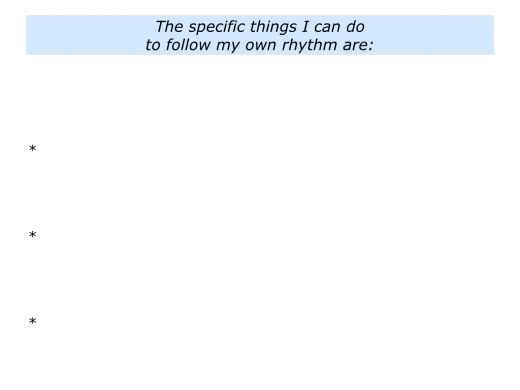 Describe the specific things you can do to keep following your own rhythm. 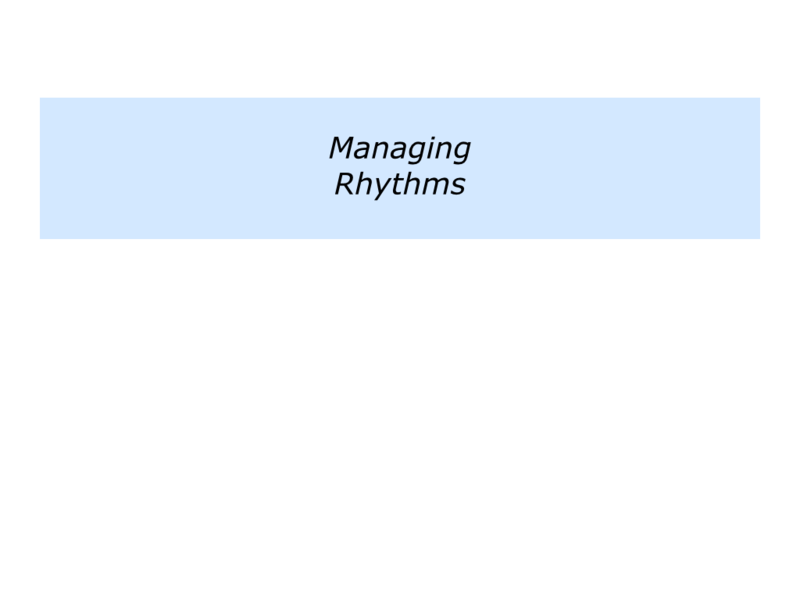 Describe the specific things you can do to manage the situations where other people – a person, team or organisation – have a different rhythm.